If you’re planning a move in Eagle Mountain and you want exceptional moving service, then select Moving Connections as your Eagle Mountain moving company. With more than thirty years of providing shipping and moving services along the Wasatch Front, Moving Connections has developed a top notch moving company that has raised the bar for quality local moving service in Northern Utah. Moving Connections is your premier Eagle Mountain residential moving service. We have more than three decades of shipping and moving experience for customers along the Wasatch Front. And our most popular service is our full service residential move. While we haven’t taken a survey, the reason for this is most likely that our customers already have a thousand and one “fires to put out” during the moving process, so why would they want to be bothered with the additional hassles of stretch wrapping furniture, packing lamps, and loading trucks when they can leave that to Moving Connections’ professional moving teams? Moving Connections’ Labor Only option is for those individuals or families who have a lot of goods and who would like to get the most return for their dollar. This Moving Connections service allows you, the customer, to pack most of the household goods, and to provide your own truck and driver, thus saving a substantial amount of labor time for our professional moving team, which in turn can save you money. 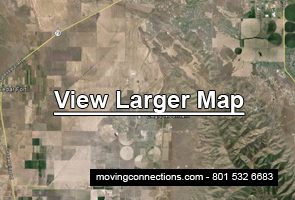 If Moving Connections is moving you to Eagle Mountain it's a perfect time to begin to utilize the many resources and bounties of Eagle Mountain. For example click on the picture to the left to go the Moving Connections 'Support - Advice - Assistance' page and discover Eagle Mountain for the first time. Once you are on the 'Support - Advice - Assistance' page go ahead and open the .pdf link found there and tape the list of emergency and useful phone numbers on your refrigerator. Moving Connections has gone to great pains to find those links and connections to integrate you quickly into Eagle Mountain life. Moving Connections has moved every kind of business from small offices moving to another floor in the same building to multi-day, multi-crew, multi-truck corporate relocations. But whatever size business move you have, you’re going to get excellent professional moving service from Moving Connections. As a federally licensed, bonded, and insured professional moving company, Moving Connections has emerged as one of the top moving service providers in Utah. And that’s why we offer top notch local moving service. We hire the best – only experienced movers need apply – because a company is no better than its personnel. So we hire outstanding team members to provide outstanding moving service. As business people ourselves, we strive to make the transition to your new quarters smooth and seamless, keeping you up and running even while you’re in the process of moving if it’s possible. And we also provide ancillary services such as storage areas, to include climate controlled storage space for those who require such a degree of service.